1. Check to see if your camera is eligible. 2. If eligible, send in your camera for evaluation. 3. 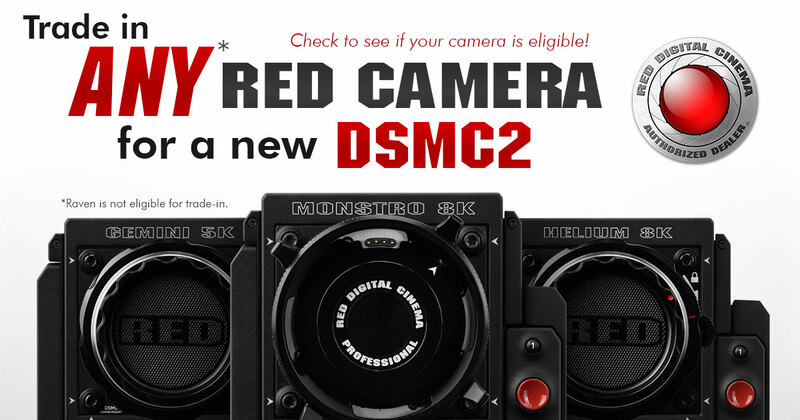 Once approved, you will receive your discount on your brand new DSMC2. The Trade-In Program allows you to receive credit towards the purchase of the following eligible RED cameras: DSMC2 MONSTRO 8K VV, DCSM2 Helium 8K S35, and DSMC2 GEMINI 5K S35.The eligible RED camera must be in functional, good working order at the time of trade-in and the customer must be the owner of the trade-in camera. You may not trade, sell convey or otherwise transfer ownership of the new camera for a period of ninety (90) days after delivery. If you fail to abide by these terms, Omega Broadcast & Cinema may charge you the full price of the new camera without credit for your trade-in camera, minus $1.The DSMC2 MONSTRO 8K, DSMC2 HELIUM 8K S35, and DSMC2 GEMINI 5K S35 BRAIN parts and labor are warranted for a period of two (2) years, subject to the warranty provisions in RED Terms and Condition of Sale (www.red.com/terms-conditions).